Super Pac Airs New TV Spot —"Save NBC News"
Help us get the spot on every NBC Affiliate! (Washington, DC)—“As families gather to celebrate the American miracle, many are troubled and in disbelief this Thanksgiving because the President of the United States has “gone rogue” and is abetted by a compliant media,” Mike Flynn, spokesman of Conservative War Chest said announcing the new 2-minute television ad. “Just weeks ago, millions of Americans voted for a new direction in this country. Unfortunately, the President has chosen to slip the surly bonds of politics and ignore the voters,” Flynn added. “We are pleased to have time on NFL football on Thanksgiving Day as well as local news over the weekend “ said Flynn. “but this if ever there was a local ad with a national message this is it.”. “Barrack Obama is a creature of the faculty lounge, believing America has a history of being wrong,” Flynn said about about one of the TV spot’s lines. “He believes only he can reshape our nation, ignoring Republicans, Democrats and even voters." “Worse though is that this almost messianic belief in himself is now combined with a temper tantrum,” Flynn added. “Obama is willing to upend centuries of the rule of law to show he is politically relevant despite historic low approval ratings." “With Obamacare in shambles and “ Grubergate" exposing the president’s own falsehoods about the law and the continuing debacle of the Obama-Clinton-Kerry foreign policy the president is isolated and angry,” Flynn said. “And, despite the best efforts of the press, IRS internal emails about the targeting of political opponents have been made public and Attorney General Eric Holder’s unprecedented extension of “executive privilege” to his own wife has been exposed." The spot details how major news organizations have suppressed stories unfavorable to the administration such as allegations of an IRS scandal and Behnghazi cover-up. “ Even the compliant media can’t satisfy Obama’s personal desires,” Flynn noted. “America is still that shining city on the hill,” Flynn noted. “This Thanksgiving, let us all pray that it is ever thus." Major Buy in New Mexico Against Tom Udall and for Allan Weh. Blame America First Spot and Hispanic Spots Are Featured. CWC Stuns Colorado Democrats with Tough Anti-Udall but Inspiring Pro Gardiner Spot that says "Hispanic Voters are Reagan Voters." CWC launches radio blitz in Arkansas! No less than Kimberly Strassel of the Wall Street Journal, and Rush Limbaugh heaped praised in 2013 on the strategy now employed by Conservative War Chest to thwart the smear tactics of Liberals and turn their smear ads into a liability for their candidates. 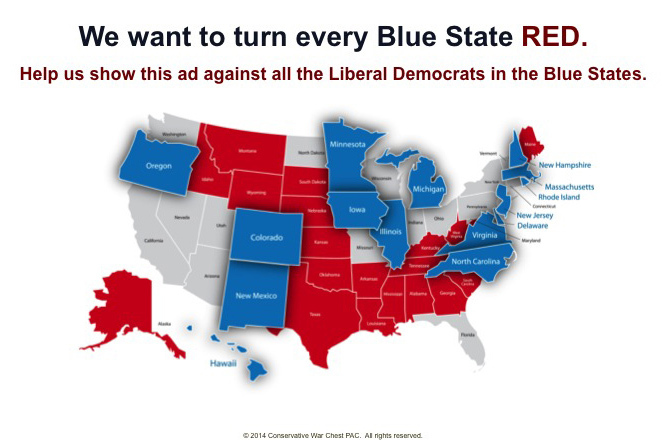 Conservative War Chest will run ads to keep elections focused on the kind of Conservative vs. Liberal issues that led to Red State victories. Conservative War Chest only runs hard on Conservative economic, social and foreign policy positions and seeks to turn every blue state Red by challenging Democrats in their strongholds.